Across Industry Archives - UEEA Training Council Inc. The WA Training Awards close in three weeks time on Friday 3rd May 2019. Apply now. The State Training Board prepares a State Training Plan each year, which contributes to the policy and purchasing direction for the State’s training system for the short to medium term. The Plan is developed each year within the context of current State and national vocational education and training policies, commitments and agreements. other relevant research and reports. Following extensive consultation with stakeholders, the Department of Training and Workforce Development (DTWD) has updated its “Apprenticeship and Traineeship Policy (A&T Policy). The revised policy came into effect on 29 November 2018, and is now available on the DTWD website. All related policy documents are now incorporated. This includes the School-based Apprenticeship Policy; Travel and Accommodation Allowance (TAA) Policy; Trade Skills Recognition Policy; and the Trade Certificate Policy. The policy includes web links for easy access to program information and fact sheets and forms for employers, apprentices, RTOs and other providers operating in the apprenticeship system. The strengthening of eligibility criteria for Western Australian trade certificates, including those issued under the Trade Skills Recognition (TSR) process, to ensure the integrity of the application and assessment processes. The new eligibility criteria will come into effect on 1 January 2019. Individuals who are qualified tradespeople in an Australian State or Territory other than Western Australia are now able to apply for a WA Trade Certificate, if they meet the requirements. The policy reflects recent changes to regulations, which clarify requirements around training plans, including school-based apprentices and trainees. Several fact sheets on the Apprenticeship Office website have been updated to align with the new policy and the following new fact sheets have been developed. The following policy documents relate to the DTWD role as Western Australia’s State Training Authority, with responsibility for administering the State’s VET system. This involves managing the investment of public resources to provide a quality training system. Please contact Anna Wildy, Manager Policy Planning and Research, Department of Training and Workforce Development on (08) 6551 5529 or email anna.wildy@dtwd.wa.gov.au, if you have any queries in regards to the new apprenticeship and traineeship policy and any of the associated policy documents. In the November edition of Australasian Transport News (ATN), HVIA Chief Executive Todd Hacking has challenged Government to incentivise the uptake of safety technologies. “Road safety is everyone’s responsibility: the people who design, build and maintain roads; the people who use the road network, such as drivers, cyclists, pedestrians and motorcyclists; the people who import or manufacture vehicles; the people who police road user behaviour and of course those responsible for implementing policy, laws and regulations pertaining to road use and road safety. “As an association that advocates for the businesses that design, import, manufacture and distribute heavy vehicles and supply components for trucks and trailers, HVIA is at the forefront of showcasing innovation, technology and the latest safety features. “Our members are constantly innovating and developing ways to make their vehicles safer. Sometimes this is mandated through the Australian Design Rules (ADRs) but often this is voluntary and is part of being a good corporate citizen. “The fact is that heavy vehicles rolling off the assembly line in 2018 are the safest yet, and as the industry continues to innovate and invest in design and technology, the safety features will continue to advance in future years. “This advancement in safety is also true for passenger vehicles. In spite of these safer vehicles operating on better performing roads and at safer speeds, Australia is not seeing the requisite downward trend on the road toll. “The tragic reality is that last year 1,227 people died on Australian roads. Sadly, this also includes 185 people from accidents involving a heavy vehicle. These deaths are largely preventable. “As such, HVIA has asked itself: what more can be done to reduce road fatalities? 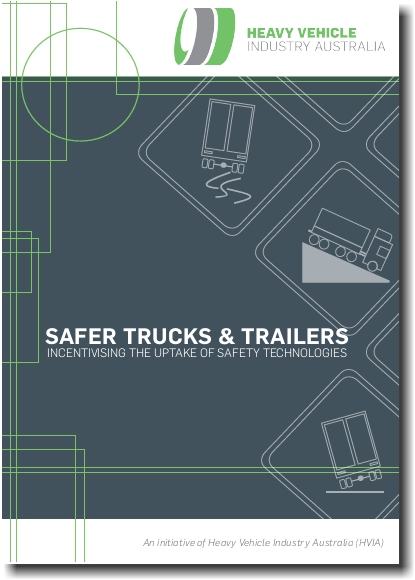 I’m proud that our members have come up with a series of priority actions which we have now released as part of a new campaign – Safer Trucks & Trailers: Incentivising the Uptake of Safety Technologies. Mr Hacking says the document is intended to start a constructive, mature discussion on advancing road safety. You can read the full article in the November ATN or online here. The Children and Community Services Act 2004 regulates where, when, and at what age children can be employed in Western Australia and these laws apply to all employers throughout the State. In most industries, children under 15 cannot be employed unless they are working in a family business run by a relative such as a parent, aunt, uncle or grandparent; performing professionally as an actor, musician, entertainer or in an advertisement; or working for charities and other not-for-profit organisations. Jobs in which children under 15 cannot be employed include working on a farm or at horse riding schools and stables, working in construction or on any building or home or garden maintenance work, and working in a factory or warehouse. The Children and Community Services Act specifies that children aged 10, 11 or 12 are allowed to deliver newspapers or advertising material, but they cannot work during school hours and cannot start work before 6am or finish later than 7pm. Workers of this age must be accompanied at all times by a parent, or another adult who has written permission from their parents. A child must be at least 13 years old to be employed in a shop, fast food outlet, café or restaurant. Employers are also required to get written permission from a child’s parent and the child is not allowed to work before 6am and after 10pm or during school hours. Breaches of the Children and Community Services Act attract penalties of up to $120,000 if the employer is a body corporate. In 2015 a supermarket business in regional Western Australia was fined $2,250 in the Industrial Magistrate’s Court for illegally employing an 11-year-old girl. The charge related to the employment of the child as a shop assistant for five shifts of work that were performed on weekend days. The UEEA Training Council, Appliance Servicing Industry and Energy Skills Solutions are happy to announce the commencement of the UEE 32111 Certificate III in Appliance Servicing apprenticeship in Western Australia. The Certificate III in Appliance Servicing was established as a Class A qualification in 2010, however delivery is unavailable in Western Australia and apprentices are required to attend training in Queensland or New South Wales. This training is inflexible, cumbersome, time consuming and cost prohibitive. Manufacturers were using small teams of their own technicians and in some cases contracting out warranty work to the appliance service specialists. Not having the apprenticeship delivered in WA, has led to the appliance service industry having serious skill deficiencies, which in turn has had an adverse effect on product reputation. Enormous efforts by all stake holders has gone into getting the training to this level, including the Department of Training and Workforce Development who have approved the funding for this apprenticeship. Energy Skills Solutions will commence training for their first group of apprentices on Monday 2nd October 2017. Recognised Prior Learning (RPL) will also be available for existing employees.